The original rural revenge film trend peaked in the late 1970s. Not released until 1982, Trapped may have been a little late out of the starting gate, but like Fruet’s earlier film Death Weekend, it has become a premiere title of this short-lived Canadian genre. All the familiar plot devices are checked, but Fruet once again succeeds in taking his violent little potboiler above and beyond the typical b-movie fodder clogging video store shelves. This story of a couple of happy-go-lucky college who get mixed up with a murderous backwoods yokel stars future CBC actors Nicholas “DaVinci” Campbell as Roger, and the curiously ever-present Canadian “celebrity” Ralph Benmurgi as his buddy, Lee. The real scene stealer here though is Henry Silva, who Fruet imported to play the villainous Henry. Silva had previously appeared as part of an ensemble in Shoot, another Canadian rural revenge flick directed by Harvey Hart, but this time he chews the scenery as an ill-tempered dirt farmer whose hobbies include moonshining and cheating on his wife. Trapped’s success is no doubt due to it’s plot, which is simple, yet effective. It was penned by the late John Beaird, whose only other screenwriting credits were the teen horror films My Bloody Valentine and Happy Birthday to Me. Not surprisingly, many of the situations in Trapped smack of slasher film set-ups, and Henry occasionally seems to become an unstoppable force in the same vein as Black Christmas’s Billy, or My Bloody Valentine’s murderin’ miner. The film begins at the local university, where Roger proclaims to his bored ethics class that he believes no circumstances can justify the taking of another human life, despite what his professor might say. With his character set-up completed, he ankles campus life and goes off to the country with Lee and their girlfriends Caroline and Diana. After some extended scenes of driving around the twisted country roads of rural Ontario, the kids decide on a camp site in the remote backwoods wilderness and settle in for some lovin’. Not far away, Henry returns to his home in Baker County where he is shocked to find his not unattractive wife cheating on him with a weak-chinned police officer. In a fit of hypocritical rage, Henry throws Johnny Law out of the house, and proceeds to redefine the phrase ” police brutality.” When one of the women in town tries to intervene to save the cop, Henry turns his anger on his wife and starts smacking her around as well. The cop uses this opportunity to take off in his patrol car, but Henry swiftly shoots out the tires, drags the cop back to his house and locks him in the cellar. The townspeople are shocked by Henry’s violent behaviour, but frankly seem too scared to do much about it. Oh, Henry’s not such a bad guy after all, because there he is in the next scene throwing a good old fashioned hoe-down for everyone! Things turn sour quickly, though. The fiddles are barely packed away when Henry caps off the party by taking the cop out back and brutally tarring and feathering him! It’s obvious that Henry is the real keeper of order in town, and when the cop distracts his tormenters and escapes, the townspeople know it’s their duty to hunt him down. The cop makes it pretty far out before the others capture him. How far? You guessed itright out to the kid’s campsite, where they all witness Henry beating the adulterer to death with a log. The hicks make a pact to keep this death quiet, because once again, no one has the guts to provoke Henry’s wrath. This doesn’t extend to those meddling kids, who hightail it to the police station to tell the sheriff what they saw. They are puzzled by his reaction, though, when he seems unconcerned about the violence. Why? Well, after the kids leave, the sheriff pulls up to Baker County and Henry reveals that the sheriff is his “little brother”another authority figure that Henry has bullied into submission! Fruet’s film pretends to philosophically ask “is killing ever justified?” but that’s barely noticeable between the scenes of naked ladies and explosions. 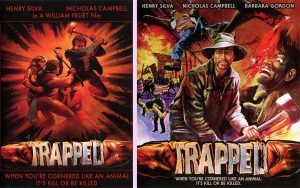 But Trapped is a great example of a rural revenge picture that carries on a Canadian tradition that goes right back to Goin’ Down the Road (which Fruet himself scripted). Trapped contains the same kind of clash between cultures that Pete and Joey faced, albeit a much more extreme (and exploitative) version. Whereas the hapless Maritimers could not adapt their way of living to survive in another part of the country, Roger and his friends discover that the ethics and rules of modern society don’t apply to the backwoods town ruled by Henry. In fact, Trapped goes even a bit further by forcing the hick’s code of violence on Roger, who as we all know, conspicuously rejected justifiable murder in the first scene. In retrospect, Pete and Joey had it good in comparison to the luckless Roger and the clueless Leeall they had to do was travel on to another province, not participate in any explosive deathmatches which destroy their cherished values.